Radon resistant new construction is an excellent way to protect your new home from elevated levels of radon gas. RRNC methods can reduce levels by about 30% and in the event that the levels are still elevated a radon fan is easily added with expected results usually below 1pCi/L. 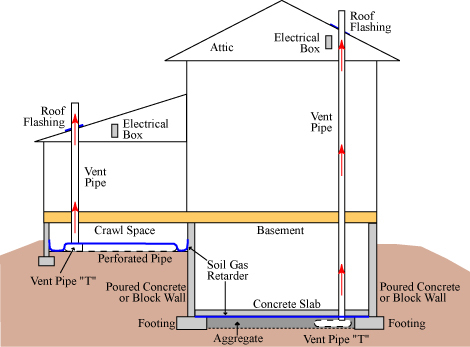 Next the radon pipe (3"or 4" PVC) is installed in a location that will allow the pipe to run through an interior wall to the roof. The efficiency of the system is greatest if the pipe can be run straight to the roof with no horizontal runs. A "T" fitting is glued on the bottom of the pipe and is inserted in the gravel. If drain tile is used the pipe is fasten to it. Finally, have the electrician place an outlet in the attic less than 6 feet from the radon pipe. If a fan is needed in the future you are all set to just plug it in.